A German consortium is developing a slick, updated version of the Trabant, communist East Germany's famously unreliable mass-produced car. The new model is electric with solar panels on the roof - in stark contrast to the fume-belching original. Makers plan to unveil a prototype of the car at Frankfurt's international motor show in September. The Trabant was first produced in 1957. Discontinued in 1991, the old cars have since developed a cult following. 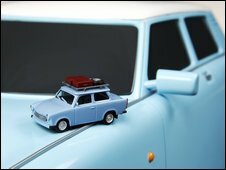 The original idea for the new car began with with Herpa Miniaturmodelle, a producer of miniature cars and aeroplanes that made a popular model version of a new Trabant. The prototype of the full-sized car has been developed by specialist auto company IndiKar, which is based in eastern Germany. It joined a consortium with Herpa and German engineering company IAV, and the firms are now hoping to raise funds to produce the new car for the market. Herpa's Daniel Stiegler said the prototype would be a simple model with no unnecessary frills, but otherwise quite unlike the communist-era version. "The original Trabant was a small, stinky car," he told the BBC. "Now we have an e-Trabant which is ecological and economical." The car will be similar in form to the miniature produced by Herpa, but not identical. Solar panels on the roof will be used to provide air conditioning. The consortium is either hoping to attract interest from a major car maker who could help produce the new Trabant on a mass scale, or smaller investors who could allow the model to be made as a more specialist product.